Hidden Garden Steps volunteer Sherry Boschert has once again outdone herself. Working with us to film a playful fundraising video that is now posted on Indiegogo, she is helping us make our current and prospective supporters aware of one of those routine yet essential elements of any successful fundraising campaign: attracting money for something as basic as a set of permits allowing us to carry to the project to completion. After confirming that we would need nearly $8,000 in application fees from the City/County of San Francisco, Sherry and I met to discuss the latest hoops that project volunteers would have to jump through to create a ceramic-tiled mosaic similar to what exists on the Moraga Steps here in San Francisco’s Inner Sunset District and surround it with attractive gardens and murals. Appreciative for all the support we have received from colleagues in the San Francisco Department of Public Works as well as in the San Francisco DPW Street Parks Program, City Hall, and the San Francisco Arts Commission, we wanted to emphasize that this particular fundraising effort is grounded in a real need and in full partnership with our City/County colleagues. Efforts to seek fee waivers were unsuccessful—our colleagues in City/County government are, of course, facing the same financial challenges so many of us face—so we’re moving ahead to publicize this particular need in the hope that project supporters will step up to the plate and push us closer to our goal. Campaigns like this one—drawing from any level of contribution our current and prospective supporters care to offer—obviously rise or fall on our ability to engage the level of community support and collaboration that has been at the heart of all our successful efforts to date. That clearly means we need help raising the funds within the next 60 days to meet our latest campaign deadline, to reach the widest possible audience, and to foster action by everyone who has been touched and inspired by our vision for taking simple steps to create another magnificent set of Steps here in San Francisco—an effort supported not only by neighborhood residents but by donors from seven states beyond California and, as of last week, our first donor from London. If you can help us by forwarding information to those you know, please do. If you can donate any amount to help us raise funds for the application fees, even better. And if you’re inspired by the sense of community and collaboration the project is helping to create, we hope you’ll join us in our efforts to clean up the site (second Saturday of each month, from 1 – 3 pm on 16th Avenue between Kirkham and Lawton here in San Francisco), prepare it for the structural repairs our DPW colleagues are about to begin, and continue helping us reach the current and prospective volunteers who are making this project soar. N.B. 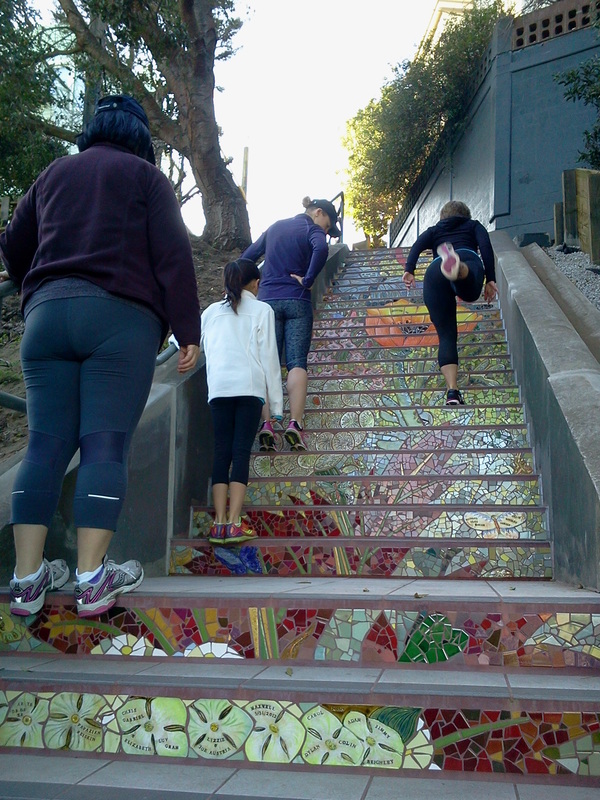 : This is the eleventh in an ongoing series of articles to document the Hidden Garden Steps project in San Francisco. While some of us would rather swim with sharks than engage in fundraising efforts, others successfully approach the challenge—fundraising, not sharks—with such panache that their actions make everyone want to dive in with them. 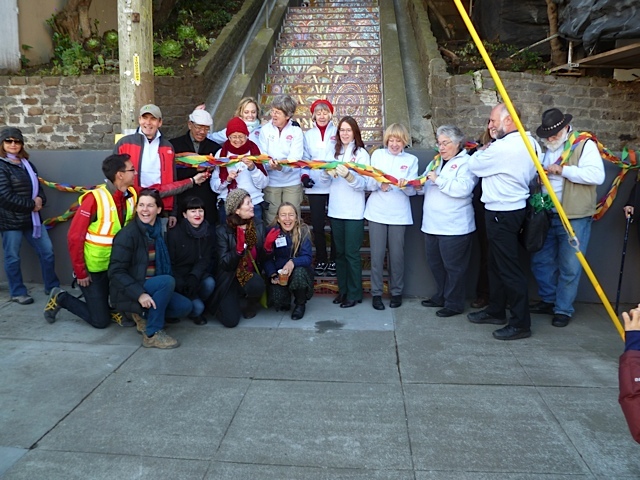 When our campaign to raise the $300,000 we will need to complete the Hidden Garden Steps project in San Francisco’s Inner Sunset District began a few months ago, those of us on the project organizing committee faced the endeavor with a sense of enthusiasm and excitement. The payoff was almost immediate: two of the multi-tiled elements—the butterfly and the dragonfly—were immediately claimed by two supporters to move us $14,500 closer to our overall goal. Donations in support of individual tiles soon followed, and we’re seeing an increase in the sale of those $150, $350, and $1,000 tiles week by week—to the point where we are close to having $30,000 for the Hidden Garden Steps. 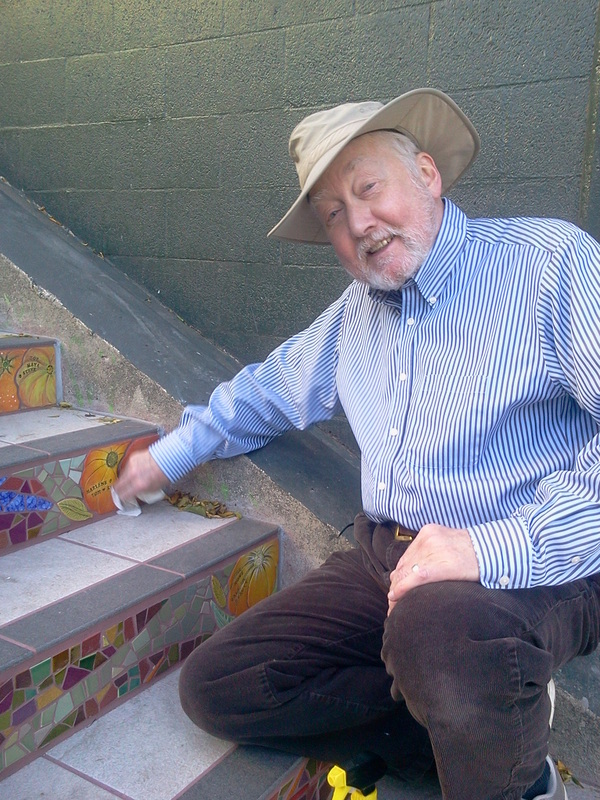 Although the primary goal of the project is to produce a set of ceramic-tile steps with a garden and large wall mural between Kirkham and Lawton streets at 16th Avenue to complement the original steps on Moraga between 15th and 16th avenues, there is an equally important vision: to continue strengthening the sustainable sense of community and the collaboration that exists among various groups in the Sunset District. Other groups—both from the neighborhood and from a much wider geographic area—are following Sherry’s example by organizing campaigns to underwrite the cost of specific parts of project artists Aileen Barr and Colette Crutcher’s design. Volunteers are also making substantial contributions by arranging for everything from cost-free sites for promotional events—and we can use more of those—to arranging for pro bono professional tree-trimming services that have already noticeably transformed the site by making it a little less hidden. As individual and organizational partners including the City & County of San Francisco Department of Public Works Street Parks Program continue to join this San Francisco Parks Trust project, enthusiasm is increasing. Support is growing, And, step by step, we are all building something of lasting value. N.B. : This is the fourth in an ongoing series to document the Hidden Garden Steps project in San Francisco. Creating a community-based, volunteer-managed, neighborhood beautification project while strengthening the sense of community in San Francisco’s Inner Sunset District took an interesting turn a few days ago: one of our volunteer supporters for the Hidden Garden Steps project went online with a charming—and obviously effective—fundraising effort to help move the $300,000 project forward. The initiative by the volunteer—Sherry Boschert, who lives with her partner near the Steps—is not only engagingly straightforward. 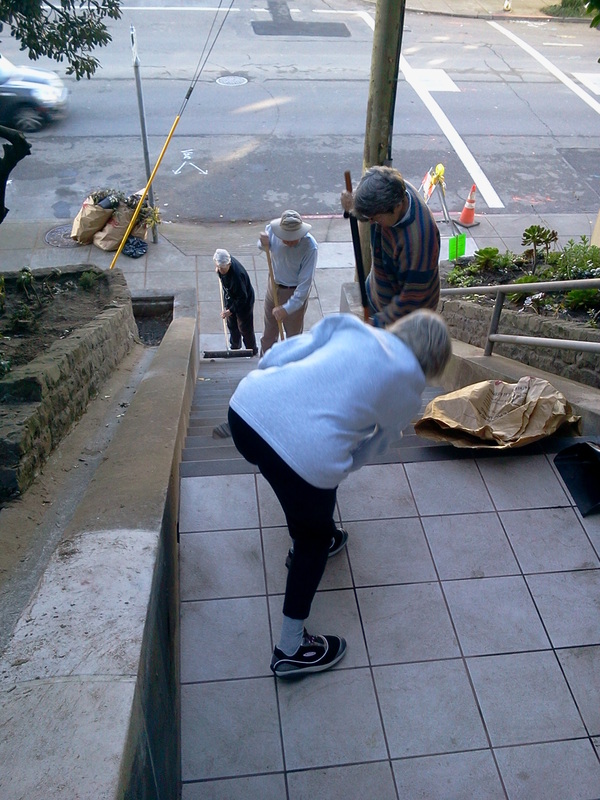 It is also very much in the spirit of the Hidden Garden Steps effort, which relies on a loosely structured organizing committee coordinating a San Francisco Parks Trust project to bring existing neighborhood individuals, groups, and business owners together in a collaborative effort to complete the project on 16th Avenue, between Kirkham and Lawton streets. Boschert did her research by talking with the project artists (Aileen Barr and Colette Crutcher) at a recent fundraising and marketing event hosted by Crepevine owner Majed Fakouri. She also, at the same event, met with organizing committee member Licia Wells for a quick brainstorming session about various aspects of her idea to bring members of the Inner Sunset GLBT community together to raise $5,000 to support the creation and installation of the Diablo Fairly Lantern tile element of the Steps project. Then Boschert, a writer and activist who has lived in the neighborhood for two decades, used the Kickstarter online fundraising platform to post the video she created. Within 24 hours, the posting had already attracted three donors who contributed more than 10 percent of the $5,000 goal for that one piece of the overall Hidden Garden Steps effort. And she has already offered to show others how to engage in similar efforts on behalf of the Steps. There is plenty to admire and to learn from here, and it reminds us of the importance of combining face-to-face and online efforts seamlessly. Boschert became interested in the Hidden Garden Steps project as a result of organizing committee members’ efforts to collected collect signatures on petitions in early 2010. She remained interested as organizing committee members held monthly meetings to create an effective project infrastructure throughout 2010; created local interest through flyers posted throughout the neighborhood and through rudimentary Facebook, LinkedIn, and Twitter accounts; began formal fundraising efforts in early 2011; and began scheduling public events in volunteers’ homes, at Crepevine, and other settings. The result of the organizing committee’s efforts, so far, has been a flow of more than $20,000 in donations not only from San Franciscans but also from San Franciscans’ friends, relatives, and colleagues in other parts of the United States. Boschert, on her Kickstarter page and in the video, creates the sense of warmth, engagement, and fun that is at the heart of the entire project: “This Kickstarter project is raising funds specifically to sponsor one element in the design—the Diablo Fairy Lantern flower—and to recognize the gay, lesbian, bisexual and transgender (GLBT) residents of the Sunset District who live near both sets of steps. “Why GLBTs? The Sunset has a reputation for being one of the city’s most conservative, straight districts, but GLBT people have always lived here too. We want to give back to the community by supporting this gorgeous project, and we will place one tile near the Diablo Fairy Lantern with the name of our social group, Out in the Fog. And as we move forward with our efforts to bring the entire project to fruition, it’s worth the time it takes to acknowledge something else equally gorgeous: the spirit of community that inspires people like Boschert to carve time out of their very busy schedules to engage in positive actions. And make us smile. N.B. : This is the second in an ongoing series to document the Hidden Garden Steps project in San Francisco. Next: Local Libraries’ Involvement in the Hidden Garden Steps Project.